Whether day or night, a trip to The Peak is at the top of everyone’s list when they visit Hong Kong. From the top of Victoria Peak, the highest mountain on the island, you get uninterrupted views of Hong Kong, Kowloon, Lamma, and a number of outlying islands, especially on a clear day. The fun begins with a trip on the Peak Tram, which for 130 years has been shuttling passengers on a very steep ride from Central up to the Peak. There are buses that run to and from the Peak, but riding up on the Peak Tram is an experience that should not be missed. Once you’ve arrived at the top, you can enter the iconic Peak Tower, which has restaurants, shops, and Sky Terrace 428, the highest observation deck. Some of the attractions inside the Peak Tower include Madame Tussauds wax museum. Those on a cheapo budget, however, can easily take a bus up to the Peak, and then skip all the tourist traps and entrance fees altogether. 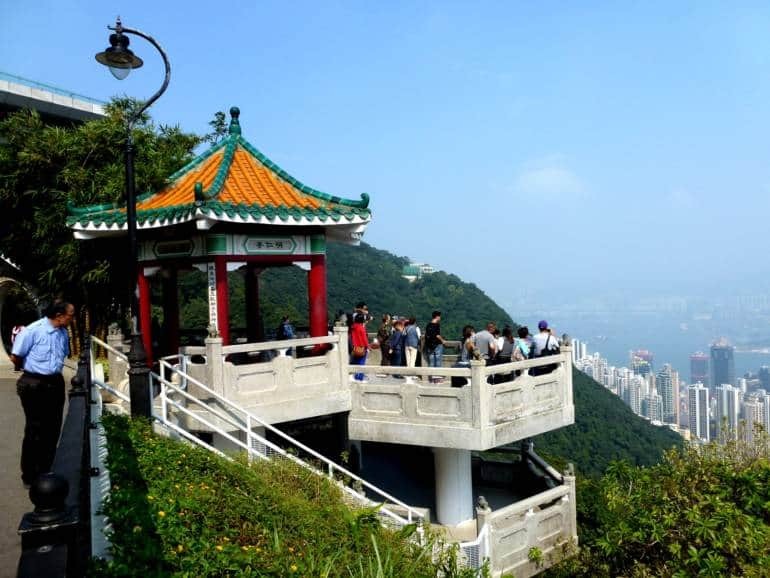 One of the best places to see the views of the harbour, for free, is from the Lions Pavilion, just east of the Peak Tower. The old footpath leads to a pretty Chinese-style observation deck with the same million-dollar views of the city, plus great photo ops with cute stone lions. Another free place to take in the view can be found in the Peak Galleria, next to the Peak Tower. This shopping complex also has the Bus Terminal where you can catch a ride back to the city, and on Level 3 is an observation deck, with free public access, and beautiful harbour views. 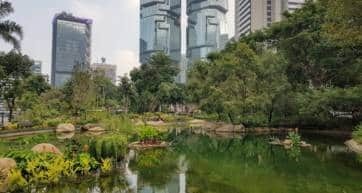 The Peak Circle Walk is a small hiking path which winds its way on narrow cliff-side paths and lookout points, with huge banyan trees and even a hidden waterfall, not to mention a peek at some of the most expensive real estate on the planet. Few tourists ever seek it out, so this is a nice way to get away from the crowds. If you’re with kids, take them to the Mount Austin Playground where they can run around and burn off some steam. The Victoria Peak Garden, nearby, is also an expansive green space with awesome views, and again is rarely crowded. The truly adventurous may want to take the tram or the bus to the Peak, and then hike back down. One recommended route is from the Peak down to Pok Fu Lam. The entrance is right outside the Peak Galleria, with signs leading you to the Pok Fu Lam Reservoir Road. This then connects with the Pok Fu Lam Family Walk—don’t worry, you’ll see the signs. On this beautiful walk you’ll pass giant banyan trees, virgin forests, and Hong Kong’s oldest reservoir. Once in Pok Fu Lam, jump a taxi or a bus back to Central.